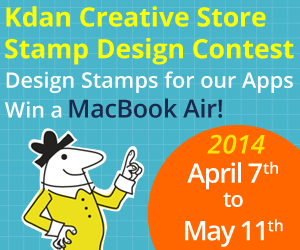 Kdan Mobile launches the 2014 Stamp Design Competition and invites graphic designers at all levels to join this event. 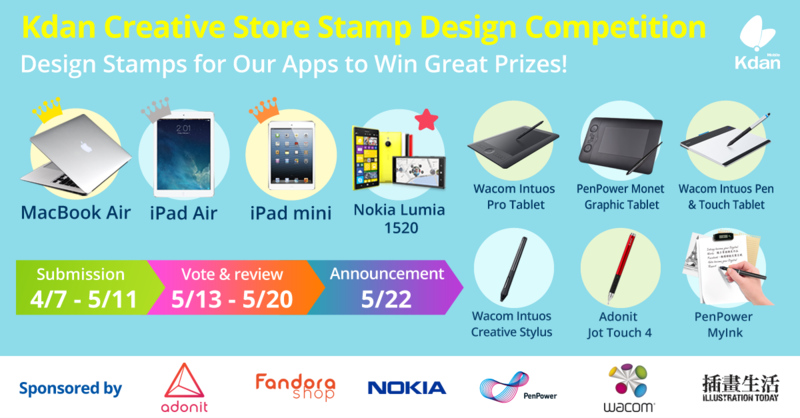 Designers can design “stamps” for apps and get a chance to win great prizes, including a MacBook Air, iPad Air, Nokia Lumia 1520 and plenty more of digital creating tools. Designers can design “stamps” for apps and get a chance to win great prizes, including a Macbook Air, iPad Air, Nokia Lumia 1520 and plenty more of digital creating tools. Kdan Mobile launches the 2014 Stamp Design Competition and invites graphic designers at all levels to join this event. This contest is calling for the creative talents of graphic designers or those interested in drawing and design. The contest is open from April 7th to May 11th, 2014. Designers may design “stamps” for apps and submit their works through the event website, and get a chance to win great prizes, including a MacBook Air, iPad Air, Nokia Lumia 1520 and plenty more of digital creating tools. Kdan Mobile, an international software developer, wants to engage and recruit designers who can enhance the content creation experience for users. The aim is to continually provide the company’s dedicated users with quality digital content creation services as well as productivity applications. For designers to enter, they must simply create a masterpiece capable of being transformed into a stamp for Kdan Creative Store. With this entry, designers have the chance to receive several benefits. The stamp design could lead to not only winning various prizes, but designers will then have the opportunity to sell future stamps and designs in Kdan’s Creative Store for further revenues. Winners of the competition, as a result, will be referred to as “Affiliated Designers” for Kdan Mobile. To enter the 2014 Stamp Design Competition, designers have between April 7th, 2014 to May 11th, 2014 to submit their works by uploading five stamp samples to the contest website for each submission. Stamps may be designed using any software. All of the submitted entries are evaluated by the judging panel consisting of design professionals along with voting from the public. “We are dedicated to offering digital content creation services to make users’ creating process easier. The materials offered in Kdan Creative Store will help users customize their works and inspire creativity,” said Kenny Su, CEO of Kdan Mobile. Details of the 2014 Stamp Design Competition are available at http://creative-store.kdanmobile.com/stamp2014. Kdan Mobile Software is a company specializing in mobile application development. Kdan aims to bring a ubiquitous mobile operating environment to end users by providing innovative service and powerful technology. (C) 2014 Kdan Mobile Software Ltd. All Rights Reserved. All other trademarks and trade names are the property of their respective owners.